A young girl embarked on a risky and arduous journey before finally arriving safely at Hanawon, a South Korean support center for the resettlement of North Korean refugees. After three months of preparing herself for civilian life, she would venture out into an unfamiliar world to face the many challenges and opportunities awaiting her. Eun Sil is one of the 32,147 North Korean defectors that have entered South Korea over the past twenty years. When North Korean defectors first enter civil society, they often face social isolation and poor job prospects. Action for Korea United (AKU) is working with other organizations and businesses to provide technical skills training, networking opportunities, mentoring, and community building to help defectors adjust to life in the South. AKU has also partnered with the Global Peace Foundation (GPF) and One Korea Foundation to carry out the One Korea Global Campaign, a movement to advance the peaceful reunification of the Korean peninsula. Eun Sil is currently studying engineering education at Hanyang Cyber University in Seoul, and over this past summer, was a panelist at an AKU forum on Korean reunification. Through ongoing forums, AKU brings together diverse sectors of civil society to discuss strategies for reunification and has articulated a shared vision for the future of building an enlightened, unified nation that could benefit humanity and spread peace to the region and world. 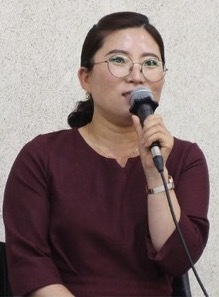 Eun Sil is one of many powerful advocates for a citizen-led process for reunification in Korea to advance a long-cherished dream of building a unified nation that spreads peace to the world. AKU’s collaborative forums are engaging many young Koreans by giving them a voice and renewing their hopes for a unified homeland. Find out how you can help support initiatives that empower North and South Koreans on the path to the peaceful reunification of the Korean peninsula.